01. 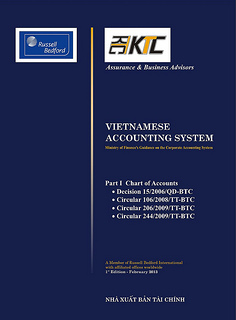 This standard aims to prescribe and guide the principles and methods for accounting revenues and costs related to construction contracts, including: contents of revenues and costs of construction contracts; recognition of revenues and costs of construction contracts to serve as basis for recording accounting books and compiling financial statements. 02. This standard applies to the accounting of construction contracts and compilation of financial statements by contractors. A construction contract is written contract for the construction of an asset or combination of assets which are closely interrelated or interdependent in terms of their designing, technology, function or basic use purposes. A cost plus contract is a construction contract whereby the contractor is reimbursed the actual costs allowed to be paid, plus (+) an amount calculated in percentage (%) of these costs or a fixed amount of charge. 04. A construction contract may be reached to construct a single asset, such as: a bridge, a building, an oil pipeline or a road or to construct a combination of assets which are closely interrelated or interdependent in their designing, technology, function or basic use purposes, such as: an oil refinery, complex of textile and garment plants. (b) Contracts for restoration or destruction of assets and rehabilitation of environment after the asset destruction. 06. Construction contracts specified in this standard are classified into fixed price construction contracts and cost plus construction contracts. A number of construction contracts have the characteristics of both fixed price construction contracts and cost plus construction contracts. For instance, cost plus construction contracts contain agreement on the maximum price. In this case, contractors need to consider all the conditions prescribed in paragraphs 23 and 24 for recognizing construction contract revenues and costs. 07. This standard’s requirements often apply separately to each construction contract. In a number of cases, this standard shall be applied to separate recognizable parts of a separate contract or a group of contracts to reflect the nature of construction contract or group of construction contracts. (c) The cost and revenue of each asset can be determined. (c) These contracts are performed simultaneously or in a continuous process. (b) The price of the contract for construction of such asset is agreed upon, which is not related to the price of the initial contract. (b) Increase and decrease amounts in the contract performance, bonuses and other payments, provided that these amounts are capable of changing the revenue and can be reliably determined. (d) When the fixed price contract sets a fixed price for a finished product unit, the contractual revenue shall increase or decrease when the product volume increases or decreases. (b) Revenue can be reliably determined. (b) The bonus can be reliably determined. (b) Other payments are accepted by the customer and reliably determined. (c) Other costs which may be recovered from customers under contractual clauses. (h) Other directly related costs. Costs directly related to each contract shall decrease when there exist other incomes not included in the contractual revenue. For example: proceeds from the sale of superfluous raw materials and materials, liquidation of construction machines and equipment upon the contract conclusion. (c) General management costs in construction. The above-said costs shall be allocated by appropriate methods, in a systematic manner and according to rational percentages, and uniformly apply to all costs with similar characteristics. The allocation must be based on the common levels applicable to construction activities. (General costs which are related to activities of contracts and can be allocated to each specific contract, also include borrowing costs if they satisfy the conditions on borrowing costs capitalized under the provisions in the standard "Borrowing costs"). 19. Other costs which may be retrieved from customers under contract clauses such as ground clearance cost, implementation cost that customers must reimburse to the contractors as provided for in the contract. (c) Depreciation of machinery, equipment and other fixed assets not used for construction contracts. 21. Contract costs include costs related to contract throughout the period from the contract signing to the contract conclusion. Costs directly related to contract arising in the course of contract negotiation shall also be considered part of the contract costs if they can be separately identified, reliably estimated and it is highly probable that the contract will be signed. If costs arising in the course of contract negotiation have already been recognized as production and business costs in the period when they arise, they shall no longer be considered the construction contract costs when such contract is signed in the next period. (a) Where a construction contract stipulates that the contractor is allowed to make payments according to the set schedule, and when the construction contract performance result is reliably estimated, the revenues and costs related to the contract shall be recognized by reference to the completed volume determined by the contractor on the date of compiling financial statement, regardless of whether invoices for payments according to the set schedule have been billed or not and how much money is inscribed on invoices. (b) Where a construction contract stipulates that the contractor is allowed to make payments according to the value of performed work volume, and when the contract performance result is reliably determined and certified by customers, the revenues and costs related to such contract shall be recognized by reference to the completed work volume certified by the customers in the period and reflected in the billed invoices. (d) Costs related to the contract can be clearly identified and reliably calculated so that actual total contract cost can be compared with the total cost estimates. (b) Costs related to the contract can be clearly identified and reliably estimated regardless of whether they are reimbursed or not. 25. The method of recognizing revenues and costs according to the completed contractual work volume is called the completion percentage method. By this method, revenues shall be determined to match arising costs of the completed work volume reflected in the business operation result report. 26. By the completion percentage (%) method, contractual revenues and costs recognized in the business operation result report are revenues and costs of the work volume completed in the reporting period. 27. A contractor may pay for the costs related to the formulation of a contract. These costs shall be recognized as advances if they can be reimbursed. These costs reflect money amounts to be paid by customers and classified as uncompleted construction projects. 28. Construction contract performance results shall only be reliably determined when the enterprises can receive economic benefits from the contracts. In cases where exist doubts about irrecoverability of certain amounts already counted into the contractual revenues and inscribed in the business result reports, such irrecoverable amounts must be recognized as costs. (c) Payment mode and time limit. Enterprises must regularly review and, when necessary, readjust the estimates of contractual revenues and costs in the course of contract performance. (c) Percentage (%) of the completed construction and installation volume on the total construction and installation volume which must be completed under the contract. The work-in-progress payments and advances received from the customers usually do not reflect the completed work volume. (b) Advances to sub-contractors before the sub-contracted works are completed. (b) Contract costs shall only be recognized as in-period costs when they have already arisen. 33. In the initial stage of a construction contract, cases where contract performance results cannot be reliably estimated may often occur. In cases where enterprises can recover already paid contract costs, the contract costs shall only be recognized to the extent that the paid costs can be recovered. When contract performance results cannot be reliably estimated, no profit amount shall be recognized, even though the total costs for contract performance may exceed the total contract revenues. (e) Contracts where the contractors cannot fulfill or perform their obligations inscribed therein. 35. When uncertain factors related to the reliable estimation of contract performance results are eliminated, revenues and costs related to construction contracts shall be recognized to match the completed work volume. 36. The completion percentage (%) method shall be based on accumulation from the construction commencement to the end of each accounting period in respect of estimates of construction contract revenues and costs. Effect of each change in the estimation of contract revenues or costs, or effect of each change in the estimation of contract performance results shall be accounted as an accounting estimation change. Changed estimates shall be used in determining revenues and costs recognized in the business result report in the period when such changes occur or in subsequent periods. (g) Payables according to scheduled progress. 38. Payables to customers are amounts received by contractors before corresponding work of the contract is performed. 39. Receivables from customers are amounts already inscribed in invoices of payments according to the scheduled progress or value of performed volume, which shall not be paid until the payment conditions prescribed in contracts are fully met or errors are corrected. 40. Receivables according to the scheduled progress is the difference between the total accumulated revenues of the construction contract recognized up to the reporting time, which is larger than the accumulated amount inscribed in invoices of payments according to the scheduled progress of the contract. This norm applies to on-going construction contracts whereby accumulated revenues already recognized are larger than accumulated amounts inscribed in invoices of progress payments up to the reporting time. 41. Payables according to the scheduled progress is the difference between the total accumulated revenues of the construction contract recognized up to the reporting time, which is smaller than the accumulated amount inscribed in invoices of payments according to the scheduled progress of the contract. This norm applies to on-going construction contracts whereby accumulated amounts inscribed in invoices of progress payments exceed accumulated revenues recognized up to the reporting time.